Forget it...I can't wait until the new year to start organizing! My messy pantry is too far gone to ignore for another few days. I'm sure most people only need to spend maybe an hour or two max, but oh no, it took me 4 hours to get my pantry in ship-shape. That being said, I can't tell you though how good it feels to have this completed. Cooking and baking will be even more fun now that I can actually access what I need! This makes me miss our butler's pantry. I understand the lining-up of the water bottles. For me, it was TyNant. The light used to hit them perfectly at 1pm. so inspiring - i'm drooling! 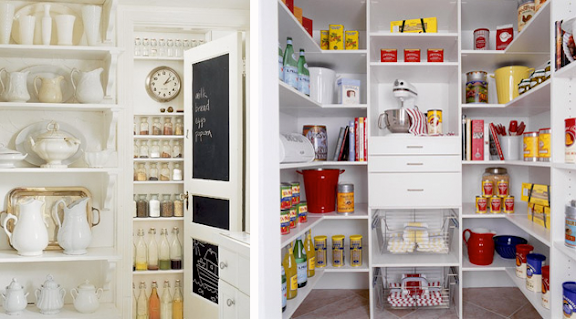 since you're organizing, wondered if you had any suggestions for keeping refrigerators organized? i'm fortunate enough to have just purchased a commercial side by side refrigerator and freezer - great but both units only have shelves and that means no drawers, etc. can't get my head wrapped around how to keep contents neat and tidy. any suggestions? It looks beautiful, great job. One day I'll have a decent size pantry, but I'm not sure it'll ever look like that. I think I drooled on the keyboard. Thanks. Oh, to have that many shelves and an actual pantry!! I shouldn't complain, we have lots of cabinets, and just totally reorganized the kitchen. We designated a top/bottom cabinet to hold all of the regular food. Pasta goes in an upper cabinet to the right of the stove, and baking items (except flour, which I store in the fridge) are in a seperate baking section of cabinets.